Feature Tweak: Already sent an email? You can still log it to the CRM! Forward previously sent emails, and we'll log them in the CRM! In the past, if you sent an email and forgot to BCC the CRM, you weren’t able to log that email; you would have to copy/paste the email in as a note, or wait for a response and forward that to the CRM. Now, you can forward emails that you have previously sent to the CRM, and we will log the message to the correct contact! The CRM detects whether the original email was from you; if it was, it will log the email to the contact you were originally sending your email to, and the activity feed will say that you sent an email to the contact. You'll notice that I did not BCC my email logging address in the original email I sent to Emily. Later, I forwarded the email to the CRM, and it properly logged to Emily's contact! 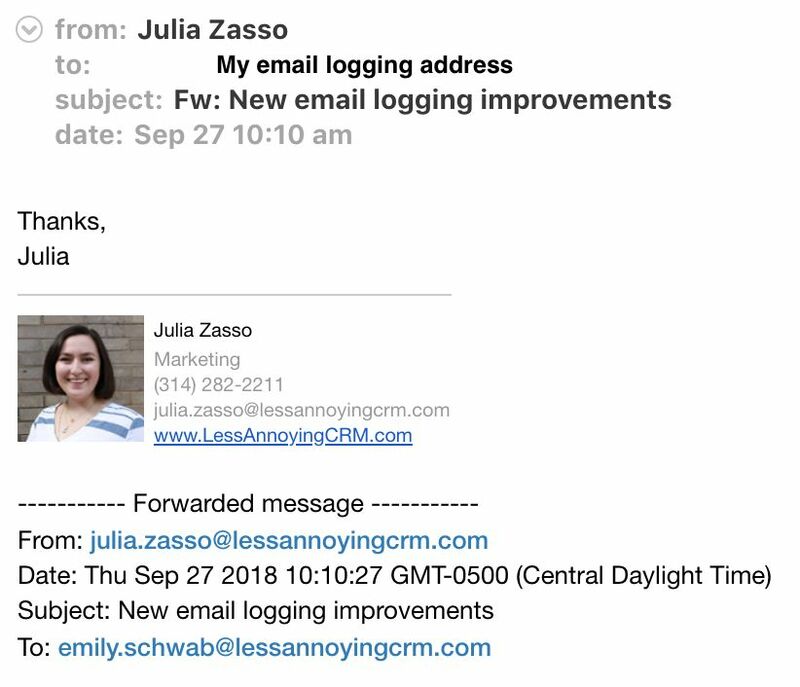 To try this out: Find an email that you’ve previously sent, but didn’t log to the CRM. Then, forward that message to your email logging address (you can find your email logging address in the yellow bar at the top of the Email Logging Settings page). The email should log to the corresponding contact within a few minutes! Note: if you use Outlook and you are emailing an internal contact in your Outlook database, Outlook will not display the contact's email address on forwarded email. This breaks the way that LACRM reads the forwarded email, so we will not be able to properly log that email. There is no way to change this setting in Outlook, unfortunately. Need help or have questions? Contact us for assistance!